The British invasion. The Beatles and the Rolling Stones: Their music, their fashion and their swagger. Rock 'n roll's first super groups took America by storm in the 1960s, changing the cultural landscape of American youth. Now almost 50 years later, like a mirage emerging from a desert oasis, a Southern California woman has answers to questions that rock 'n roll's fans asked for decades. "I was just in awe of all these beautiful people," said Patti Daley, 64. "They were just our friends, it was amazing." The answers lie within boxes that Daley has stored for decades underneath her bed, in her home two hours east of Los Angeles. 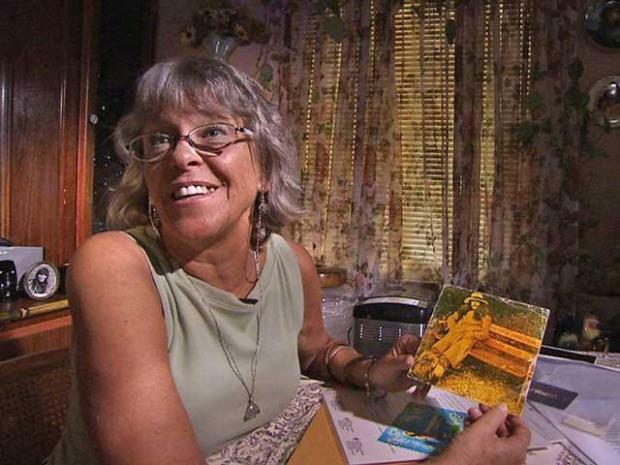 A Southern California woman has answers to questions that rock n roll's fans asked for decades. Inside the boxes are a treasure trove of old photo albums full of rare Polaroids of icons in rock, plus John Lennon lyrics, and letters and cards from members of the Beatles. These are items the public has never seen, until now. Perhaps the rarest set of photos she owns are two Polaroids of Paul McCartney playing piano inside Lennon's beach house in 1974. It was their first meeting since the Beatles breakup in 1970. "It's incredible, incredible, a lot of these things are things we've only read about," said Chris Carter, host of the nationally syndicated radio program "Breakfast with The Beatles." "I saw a picture of Mickey Dolenz climbing up a hill, a picture of Keith Moon on a shag carpet," added Carter. "You know these are rock icons and these pictures no one has ever seen. And they are not published in 25 Beatles books. These are really first time viewings for these pictures." Amazingly, Patti's treasure includes more than just photos. She also has handwritten cards from George Harrison and John Lennon, plus personal notes from now legendary recording sessions, all signed by the musicians who were there. But the potential motherload are several song lyrics from Lennon's "Walls and Bridges" recording sessions, including what is believed to be his hand-written lyrics to his only number one song "Whatever Gets You Through the Night." "I came to acquire those after sessions," Daley remembered. "John would come in and put the lyrics on a podium. And he would just leave them there for me to pick up." Daley also has a copy of a letter John Lennon sent to record executives in 1976. Although it might not be worth a lot of money to collectors, it's significant historically. In the letter, Lennon was angry with Capitol Records about the cover art selected for the Beatles' first greatest hits album "Rock 'N Roll Beatles." Among other things, an animated Lennon accuses the record executives of trying to ruin the image of the Beatles. Daley was the ultimate rock 'n roll insider. She said the love of her life was a well-known session guitarist named Jesse Ed Davis, a man many consider one of the greatest unsung guitar heroes in rock 'n roll. "He was the most subtle, tasty guitar player when rock and roll was really happening," said Daley. "Everyone loved his playing and sought after him to play on their records." Legends like all the Beatles, members of the Rolling Stones, Rod Stewart and the Faces, Bob Dylan, Eric Clapton and more all enlisted Davis' skills on his trademark Fender Telecaster. Daley said, "I still hear him on the radio, I listen to the old stations, it makes my heart smile." For more than a decade, she toured the world with Jesse and her young son Billy, not only baring witness to, but also documenting, what is now a legendary time in pop culture. A mother armed with a Polaroid camera, Patti took candid, one-of-a-kind pictures of icons in rock. "I just kept my Polaroid camera on me all the time in my purse, and when I'd see a good shot, I'd take them candidly," said Daley. The photos are incredible: From a young Mick Jagger and Charlie Watts in the early 1970s, to several shots of a care free Ronnie Woods before he joined the Stones, to a series of Beatles photos after the breakup -- many taken during John Lennon's "Lost Weekend." In 1973, Lennon separated from his wife Yoko Ono and began an 18-month relationship with his secretary May Pang. It was a relationship that Yoko reportedly initiated. And the couple spent quite a bit of time at a rented beach house in Santa Monica. Lennon later referred to this time as his "Lost Weekend." "It's always desirable to have material from somebody who was part of an inner circle, somebody who was really a witness to history," said Dr. Catherine Williamson, director of Books and Manuscripts at Bonhams & Butterfields auction house in Los Angeles. Williamson said, if authenticated, Daley's treasure could be highly desirable not only to collectors, but also potentially to museums. As for Daley, she is not sure what she will do with her treasure. She admits, though, that it was an incredible time in her life, and now she wants to share it with the world. She said, "I feel very privileged to have met the people I have met and heard the music I have heard." Editor's Note: NBCLA will have a series of reports this week on this "Rock-N-Roll Treasure." On Monday, we bring you more never-before-seen photos from John Lennon's Lost Weekend. Plus, what Patti Daley remembers about that day in 1974 when Paul McCartney and John Lennon first got together again to play music.